China’s meteoric rise over the past half century is one of the most striking examples of the impact of opening an economy up to global markets. Over that period the country has undergone a shift from a largely agrarian society to an industrial powerhouse. In the process it has seen sharp increases in productivity and wages that have allowed China to become the world’s second-largest economy. While the pace of growth over recent decades has been remarkable, it is also important to look at what the future might hold now that a large chunk of the gains from urbanization have been exhausted. 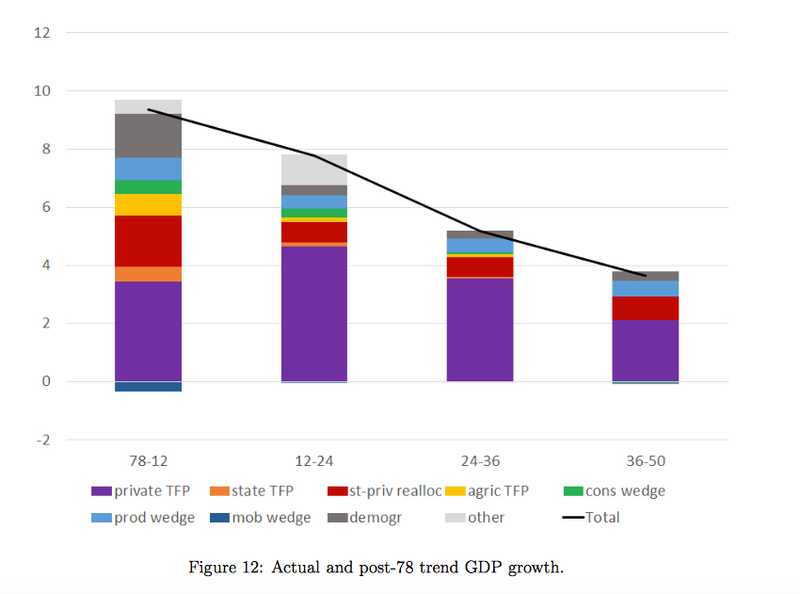 A new paper published by the NBER attempts to do just that, looking back over China’s growth story between 1953-2012 and using the data to model plausible scenarios for the country up to 2050. 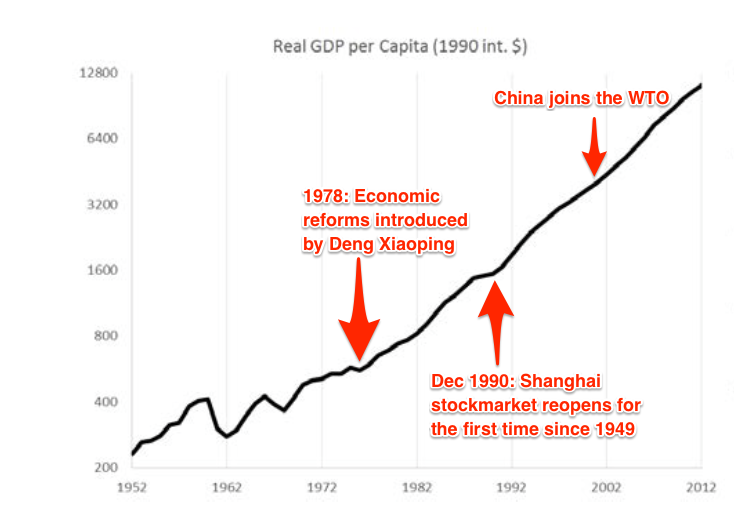 The first two decades following the founding of the People’s Republic of China in 1949 was marked by periods of substantial growth in per capita GDP growth, the growth of output per person, followed by sharp reversals. The authors of the NBER paper suggest this represented the success of the First Five-Year Plan, during which “6000 Soviet advisers helped establish and operate the 156 large-scale capital intensive Soviet-assisted projects”, significantly increasing the pace and quality (productivity) of industrialization in the country. However, it was followed by the Great Leap Forward (1958-1962), which undid many of the gains through worsening of incentives by banning material incentives and restricting markets. These reforms were then unwound between 1962 and 1966, leading to another period of productivity and per capita GDP growth, before the events of the Cultural Revolution (where strikers clashed with the authorities) set the economy back once again. According to the authors, the Third Plenary Session of the 11th Central Committee of the Communist Party in December 1978 was the defining moment in shifting the country from its unsteady early economic trajectory on to a more sustainable path. It laid the groundwork for future growth by introducing reforms that allowed farmers to sell their produce in local markets and began the shift from collective farming to the household responsibility system. A year later the Law on Chinese Foreign Equity Joint Ventures was introduced, allowing foreign capital to enter China helping to boost regional economies although it took until the mid-1980s for the government to gradually ease pricing restrictions and allow companies to retain profits and set up their own wage structures. This not only helped to boost GDP from an annual average of 6% between 1953-1978 to 9.4% between 1978-2012 but also increased the pace of urbanization as workers were drawn from the countryside into higher-paying jobs in cities. These reforms had a significant impact both on per capita GDP and the pace of the falling share of the labour force working in agriculture. The good news for the global economy is that the authors of the NBER paper claim that the Chinese economy can continue to see relatively robust levels of growth, albeit significantly lower than we have seen over recent decades. While the average growth rate of real GDP between 1978-2012 has been an impressive 9.4%, that figure could decline to between 7-8% between 2012-2024 in the authors’ base case. This is significantly higher than most commentators believe is likely given clear signs of a slowing economy in China’s recent economic data. Of course, such long-range projections should be treated with a great deal of caution but the trajectory of travel is already clear – growth is slowing. This is to be expected for an economy of China’s size, as compounding makes it harder and harder to deliver the same rate of growth from a higher level of GDP. Moreover, the factors that have driven the country’s expansion over recent decades will also have to shift in their relative importance. For example, the numbers of people making the shift from agricultural jobs into higher value add city jobs are likely to decrease and the process of urbanization will therefore not be able to add as much to output per worker as it has done in the recent past. Also, the catch-up process that has delivered significant productivity growth in the country is also likely to slow as Chinese industry gets closer to the technological sophistication of its Western counterparts, while the initial gains of adding hundreds of millions of workers to the global labour supply are also quickly fading. Instead of allowing low-cost exports to drive growth, China will increasingly have to rely on expanding its own domestic demand to meet the government’s ambitious growth targets. Achieving this, however, will require further reforms to release Chinese consumers’ spending power and build the foundations of a more balanced economy. How can China find new routes to growth? Can China tackle its debt challenge?